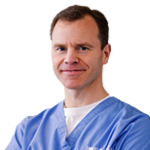 Dr. Allen earned his medical degree from Western University of Health Sciences in Pomona, California and completed his Ophthalmology residency at the Wilford Hall Medical Center/Brooke Army Medical Center in San Antonio Texas. Prior to joining The Portland Clinic, Dr. Allen was the director for Tripler Army Medical Center’s Refractive Surgery Program and practiced general Ophthalmology. He also recently spent time providing ophthalmology services in Afghanistan. He is a member of the American Academy of Ophthalmology and is board certified by the American Board of Ophthalmology. He provides eye care as well as performs refractive surgery (laser vision correction).